Want freedom from glasses and contact lenses? The concept is simple: you work hard to create the perfect view from your home with your beautiful garden. But when you want to look out and enjoy the fruits of your labour, glasses and contact lenses can hinder this. With spring in our sights, we’re experiencing better weather and more daylight. When you wake up in the morning, you want to throw back the curtains and immediately see your freshly mown lawn, the proud trumpets of your daffodils, and pansies dancing in the breeze. With prescription windows from Cloudy2Clear, you can do just that, without being encumbered by glasses or contact lenses. And what about your morning brew in your front room? Survey your street with the freedom of prescription windows. Nose on your neighbours with the added benefit of them thinking you can’t see. Perfect for those who like to subtly keep abreast of the neighbourhood gossip. Is my home suitable for EyeQ Glazing? 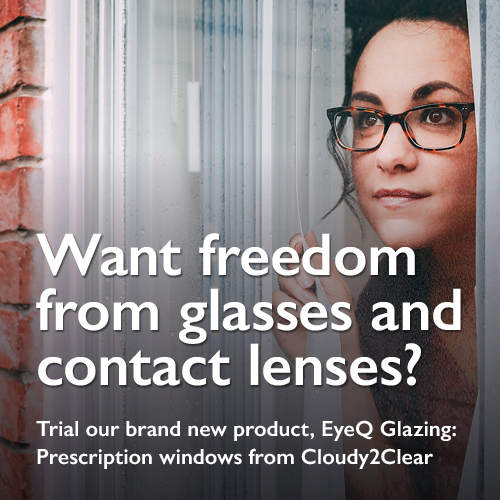 If you have the need for contact lenses or glasses and you’re fed up of the world being a blur when you wake up, or you’re sick and tired of your neighbours accusing you of being nosy, then EyeQ Glazing is the right choice for your home. Cloudy2Clear will only replace the pane and not the entire frame, making prescription windows the best choice for you. How will you install EyeQ Glazing? We provide you with a free, no obligation consultation with one of our experienced glazometrists, who will review your prescription and then provide you with a suitable quotation. Our glass technology means we can deal with even the most complicated prescriptions, fitting the windows exactly to your needs. How much does EyeQ Glazing cost? We create bespoke quotations for all of our customers, so that our products fit your needs entirely. Most of our prescription windows start from £90 per window. Once we’ve replaced your windows with EyeQ Glazing, the aftercare and recovery process is simple. You can start enjoying the perfect view from your windows almost immediately, with only a small clean up time – which we take care of. Book your free consultation today on 0800 046 5391 with your local branch and start seeing the world with the perfect view. I’ve been one of the first to trial Cloudy2Clear’s prescription windows and I’ve never felt more liberated in my own home! Waking up in the morning and viewing my garden in the sunshine, with no need for glasses or contact lenses is just a dream! I can’t believe someone hasn’t thought of this idea before. Cloudy2Clear’s EyeQ windows have given me the opportunity to view the whole of my street, without my glasses smacking off my panes as I try and crane my neck. Seeing my vegetable patch in all its glory in the morning and as the sun sets, without having my tired eyes require glasses or contacts is simply marvellous. I recently had my kitchen window changed, but now I’m going to sort the whole house!